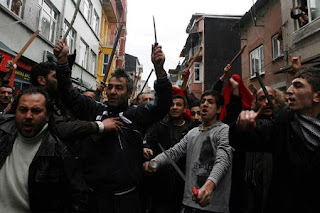 Two recent mob attacks, one on leftist students in Edirne thought to be PKK supporters and the other on Roma in the Selendi district of Manisa, have again put the question of lynchings front and center. In both cases there are plenty of questions about the police response, accusations arising that the police did little to nothing to curb the violence. According to Bianet, the Dec. 27 Edirne attacks sparked a second wave of protests on the same street on Jan. 3, as well as in Erzincan and Kars. For a video of the Edirne attacks, click here. Jenny White has an excellent post documenting recent lynch attacks, tieing the Edirne and Manisa mobs to a greater lynching phenomenon. Both lynchings were sparked by the same rising racial-based nationalism that I have written about here before (see, for example, June 26,2008 post), but the increased frequency, and possibly, organization, of these attacks should be cause for concern. In November, convoys of DTP politicians in the cities of Izmir and Canakkale were also attacked by mobs. UPDATE I (1/15) -- The MHP mayor of the Selendi district in Manisa visited neighboring Gördes district, where up to 76 displaced Roma were re-located, and asked them to return. Some have accused the mayor of refusing to adequately respond to the attack and/or helping to foment it. Any other details as to just how the mayor did the latter are appreciated.